Today the auditorium of the Hermitage Theater and all its premises are completely reconstructed. The decor of the hall, lines of armchairs, ceiling, illumination and acoustics are restored exactly as it used to be. Modern scenic equipment, sound amplifiers and light installations with computer usage, and a perfectly gracefully weaved curtain make this unique gem so beautiful it must be seen. The Hermitage Theater is the largest pearl in the necklace of treasures of the Hermitage. 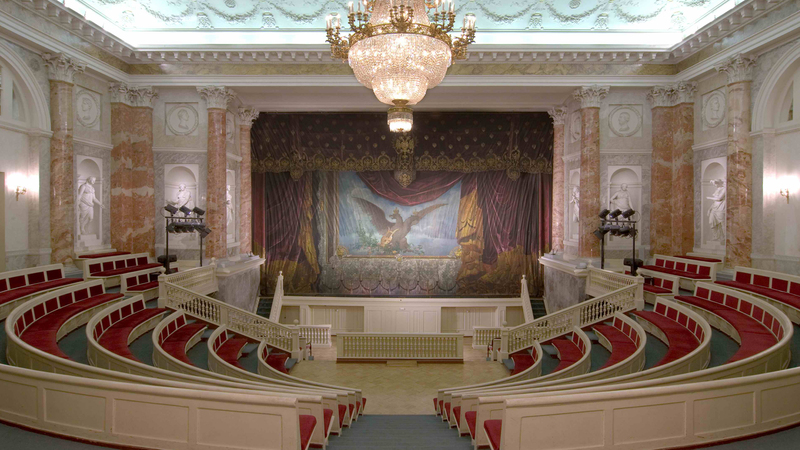 The stage of the Hermitage Theater is distinguished by a special beauty, graceful decorations, and a unique historical tie to the Imperial past of the Hermitage that hosted performances attended by Catherine the Great.